Home turf advantage for Armidale’s young Stirling Osland on Tuesday is as significant as historic home ground edge for Rugby League’s State of Origin combatants. Leading the Armidale training premiership, Osland is rolling with regular regional winners including Rosehill Gardens TAB Highway favourite Radiant Choice, and Stirling has the numbers for another profitable day for his many followers at Armidale. The astute young trainer, in just his third season after a stint with the Corstens in Victoria, has trained 20 winners this season after bursting to prominence with a winning treble at the Armidale TAB Cup meeting in 2017. He rarely misses at home for connections, and Stirling combines with in-form stable rider Ben Looker and Josh Oliver with five value contenders throughout the seven-race TAB programme. 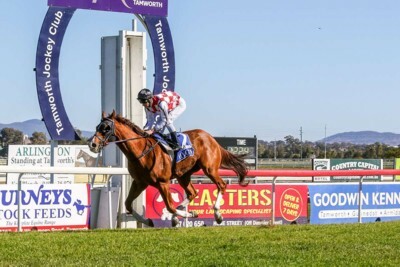 Radiant Choice salutes at Tamworth last month. Credit: Bradley Photos. However Stirling assessed his Armidale chances with less confidence that he has in strong Highway prospect Radiant Choice for Rosehill Gardens on Saturday. At Armidale in the opening event a two-year-old maiden (1100m) Osland is represented by debut runner Leafy Green. Stable new comer Arugula contests the second event, also an 1100m maiden. Acraman is in the 1400m maiden. Last start Quirindi winner First Family contests the BM 60 1400m race. Chardoneri is contesting the class one 1100m race and has started at long odds at several times this preparation. Wyong trainer Allan Kehoe combines with Greg Ryan with a couple of strong chances after Ryan rode a treble at Dubbo on Monday. Armidale at present is rated a good four and fine weather is predicted. View the fields, form and race replay for Saturday's Rosehill meeting here. View the fields, form and race replay for Tuesday's Armidale meeting here.